A comprehensive guide to effective strategic management of health care organizations. Strategic Management of Health Care Organizations provides essential guidance for leading health care organizations through strategic management. This structured approach to strategic management examines the processes of strategic thinking, consensus building and documentation of that thinking into a strategic plan, and creating and maintaining strategic momentum – all essential for coping with the rapidly evolving health care industry. Strategic Management of Health Care Organizations fully explains how strategic managers must become strategic thinkers with the ability to evaluate a changing industry, analyze data, question assumptions, and develop new ideas. The book guides readers through the strategic planning process demonstrating how to incorporate strategic thinking and create and document a clear and coherent plan of action. In addition, the all-important processes of creating and maintaining the strategic momentum of the organization are fully described. Finally, the text demonstrates how strategic managers in carrying out the strategic plan, must evaluate its success, learn more about what works, and incorporate new strategic thinking into operations and subsequent planning. This strategic management approach has become the de facto standard for health care management as leadership and strategic management are more critical than ever in coping with an industry in flux. 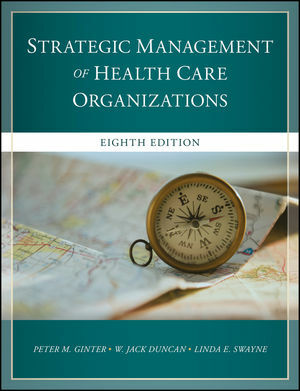 This book provides heath care management students as well as health care administrators with foundational guidance on strategic management concepts and practices, tailored to the unique needs of the health care industry. Included are a clear discussion of health services external analysis, organizational internal analysis, the development of directional strategies, strategy alternative identification and evaluation, and the development and management of implementation strategies providing an informative and insightful resource for anyone in the field. Create a process for developing a strategic plan for a health care organization. Map and analyze external issues, trends, and events in the general environment, the health care system, and the service area. Conduct a comprehensive service area competitor analysis. Perform an internal analysis and determine the competitive advantages and competitive disadvantages. Identify strategic alternatives and make rational strategic decisions for a health care organization. Develop a comprehensive strategy for a health care organization. Create effective value-adding service delivery and support strategies. Translate service delivery and support plans into specific action plans. The health care industry’s revolutionary change remains ongoing and organizational success depends on leadership. Strategic management has become the single clearest manifestation of effective leadership of health care organizations and the strategic management framework’s strengths are needed now more than ever. The Strategic Management of Health Care Organizations provides comprehensive guidance and up-to-date practices to help leaders keep their organizations on track. Peter Ginter is the lead author for this project (and the one who I have had the most contact with so far). Peter M. Ginter (Ph.D., University of North Texas; M.B.A., B.S., Auburn University) is a Professor in The Department of Health Care Organization and Policy and Director of the Preparedness and Emergency Response Learning Center. He is also a Senior Scholar in the Lister Hill Center for Health Policy in the School of Public Health at the University of Alabama at Birmingham. Dr. Ginter is active in research in strategic management, leadership, and health care organizations. He is the author or co-author of sixteen books including Strategic Management of Health Care Organizations, 7th edition. (2013), Public Health Leadership and Management (2002) and The Physician Strategist (1996). W. Jack Duncan is Professor of Management Emeritus & University Scholar Emeritus in the Graduate School of Management at the University of Alabama at Birmingham. He also holds appointments as Professor of Health Care Organization & Policy in the School of Public Health and Professor of Health Services Administration in the School of Health Professions. Duncan is a Senior Scholar in the Lister Hill Center for Health Policy. He received his Ph.D. from Louisiana State University in Baton Rouge. Linda Swayne joined the faculty of the Belk College of Business, UNC Charlotte in 1981 and is now Professor of Marketing. She has served as president of the Charlotte Chapter of the American Marketing Association, Southern Marketing Association and Southwestern Federation of Administrative Disciplines. Dr. Swayne has written eleven textbooks. Case 5 LINET Americas: This Bed Is Just Right!